As on any trail, FT thru-hikers will want a water treatment system that is lightweight, reliable, thorough, and produces a decent amount of drinking water is a relatively short amount of time. However, water sources on the Florida Trail are radically different than the clear mountain streams and springs of the AT or PCT. Florida's shallow, slow-moving waters are filled with particulates like algae, clay, silt, and decaying plant matter. The water is so thick with material that filters quickly become clogged, even when you pre-filter with a handkerchief et cetera. Blue-green algae (cyanobacteria) produces neurotoxins as well as hepatotoxins that damage the liver. Florida's warm subtropical climate and the abundance of plant matter in the water support large populations of worms, parasites, amoebas, protozoa, and bacteria. Fortunately, viruses are not found in Florida waterways or anywhere in North America. This is only an issue in developing countries. Sometimes your only water source may be a muddy pool a few inches deep at most. You will need to be able to skim water from these pools without stirring up so much mud that the water is rendered useless. Without mountains, the Florida Trail cannot isolate hikers from pollutants that accumulate in valleys by keeping them near high ridgelines and so forth. Furthermore, Florida's flat topography means few bodies of water are safe from exposure to chemical runoff from citrus groves, cattle pastures, roadways, and suburban lawns. Since the Florida Trail passes many polluted bodies of water and most backpacking treatment systems do not eliminate chemicals, we have a lengthy guide to help you identify safe and unsafe water sources at our on-trail issues: drinking water page. UV light treatment with a SteriPEN and chemical treatments like Aqua Mira will not eliminate the clouds of leaf litter, dirt, and algae in the water. We doubt anyone will want to drink such water without filtering it first but saving weight tempts people to do foolish things — like all those hikers on the AT and PCT who roll the dice and don't treat their water at all. It is easy to imagine a parasite or cyanobacteria encased within an invisible clump of clay surviving a douse of Aqua Mira or zap of UV light. For that reason we want to discourage any notion that you can still use Aqua Mira or a SteriPEN by first filtering water through a handkerchief or pantyhose. The gaps between fibers in these materials are enormous relative to microbial life. Water filtered through a handkerchief doesn't even appear clean to the naked eye (we've tried). But let's image that a chemical treatment did manage to kill every microorganism. Would you still want to consume dead cyanobacteria (blue-green algae) that produce toxins like neurotoxins and hepatotoxins that damage the brain and liver respectively? The safest, most versatile choice is the classic MSR MiniWorks EX, which eliminates particulates, bacteria, and protozoa, as well as some organic chemicals and toxins. Once a thru-hiker standard, AT hikers ditched its 16 ounces of weight after Aqua Mira came out. However, since there are so many sketchy water sources on the Florida Trail, its ability to eliminate toxins justifies the weight and makes it a top choice. 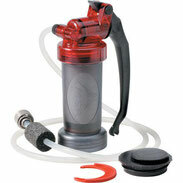 The MiniWorks has an easy-to-clean ceramic filter that's durable and will last multiple thru-hikes. The carbon core (a new-ish feature not present a decade ago) is what eliminates some organic compounds and toxins. Hikers complain that the ceramic filter must be cleaned often, but a simple trick solves that problem: wrap three paper coffee filters around the end of the hose and secure them with a rubber band. Coffee filters last a surprisingly long time and block particles bigger than 15 microns across (though the exact pour sizes of coffee filters are not standardized and do vary). This decreases the frequency of cleanings. 1) Dirty Water Jug — To reach the deep, clear water of a cypress dome, for example, you will need to slog through mud and muck. Since filtering takes time and there is no place to sit down, you end up standing in the water while pumping away. If the filter clogs, you spend even more time standing in the water/mud while cleaning the filter. It's never much fun, but it's especially tedious at the end of the day. To avoid all that, we recommend carrying an empty gallon jug for dirty water (not a bladder). With an empty jug you can walk out to the water source, fill up, and later filter while back in camp on dry land (or in a shady spot if it's in the middle of the day). With a milk jug you can drop the MiniWork's source hose into the jug, which is not possible with a soft-sided bladder. 3) Coffee filters & a rubber band — to decrease the frequency of cleanings, wrap three paper coffee filters around the metal coil at the end of the hose and secure them with a rubber band or hair tie. The ultralight choice for thru-hikers on any trail is now the Sawyer Mini. While it will not remove organic compounds and toxins, and clogs quickly without pre-filtering, many hikers love the Sawyer for its astonishing 1.4oz weight, low price of $25, and longevity. While we are skeptical of Sawyer's claim that it lasts for 100,000 gallons, since this is 99,000 gallons more than the nearest competitor, one will certainly last an entire thru-hike or two. Two complaints: First, in order to force water through the filter you are supposed to squeeze the bags that come with the Mini (and the larger Sawyer Squeeze). However, the bags consistently burst in your hands while squeezing. For most thru-hikers we have spoken with, and from our own experience, this happens after about 3-4 weeks of use. They just aren't durable enough for a thru-hike. Use a Platypus bag instead. Secondly, the rubber O-ring at the base of the threading that screws onto water bottles/Platypus bags is too soft. If you screw the Sawyer too tight onto a bottle, the soft O-ring gets squeezed down into the bottle. The connection is then no longer waterproof and leaks. 1) Platypus bag for dirty water — To filter a large quantity of water at the end of the day for dinner and breakfast, screw the Sawyer Mini onto a Platypus bladder, hang it on a tree branch, and let gravity do the work. The 2 liter Platypus Hoser bag weighs 3.6 ounces. 2) Dirty water scooper — To get water from shallow pools and pour it into a narrow-mouthed Platypus, you'll need a plastic half-gallon jug cut to make it into a handled bucket. 5) Replacement O-ring — The O-ring that comes with the Sawyer Mini is flimsy and allows leaks. Replace it with an O-ring from a hardware store intended for garden hoses or kitchen sinks. There are lots of water filters for campers on the market, and while many are not appropriate for thru-hiking, or Florida, or both, there a few other options that we felt were worth considering. A comparison chart is below. Our reasons for rejection: The Sawyer Squeeze is a bigger version of the Sawyer Mini but it's not our top pick because it costs twice as much as the Mini with the only benefit being a slightly faster liters-per-minute rate. The Platypus GravityWorks is essentially a hollow-fiber filter connected between two Platypus bags, but the MSRP is $120, which seems ridiculous considering you can create the exact same set-up with two Platypus Hoser 2L bags and a Sawyer Mini for a lot less money. The MSR AutoFlow is the same concept as the GravityWorks, at the same price point, and yet weighs more without including a second clean-water bag. The MSR SweetWater is a pump-action filter with a toxin-eliminating carbon core like the MiniWorks EX but the handle breaks easily and the cartridge doesn't last very long, which to us does not justify the 5oz of weight savings over the MiniWorks EX. We did outright reject a number of popular filters and discourage thru-hikers from buying models not on our list. For example, the MSR Hyperflow is incredibly tedious to clean and not good for thru-hiking. The 12-ounce weight of the Katadyn Hiker Pro can't be justified due to its large pour size (.3 microns) and short lifespan of just 750 liters. Finally, not only does the Katadyn Pocket weigh 24 ounces and cost $370, but it contaminates the water with traces of silver, which can have long-term health effects. Twenty years ago, every hiker carried at least one 32oz Nalgene bottle. Made from shatterproof #7 plastic, they seemed indestructible and became so ubiquitous on trails that manufacturers like MSR and Katadyn designed water filters to screw onto Nalgene's wide openings. Maybe it was the realization that #7 plastic (polycarbonate) contains BPA, but at some point people started questioning whether they should spend $10-$15 on a plastic bottle that weighs around half a pound. And that supposed indestructibility? A 32oz Gatorade bottle is equally as indestructible, weighs far less, and comes free with the purchase of $2 worth of Gatorade. Today, the thru-hiker's favorite water container is a 1-liter SmartWater bottle. Why? One liter is a large volume and yet the bottle is tall and thin so fits easily into a backpack's side pockets. Gatorade or Powerade bottles with similar volumes are much wider and so don't easily fit into side pockets. The bottle is smooth and straight, making it easier to take in and out of side pockets while wearing the backpack. The curvy design of an Aquafina bottle, for example, makes it more difficult. The bottle is surprisingly sturdy and won't collapse like a standard disposable water bottle. The Sawyer Mini & Squeeze screw onto the bottle. You can fill the bottle directly from the water source, screw on the Sawyer, and drink. At supermarkets, a bottle costs between $1-2, which is rediculous for a liter of water but great for a very functional piece of gear that will last an entire thru-hike.